Jenna (Nova) has been cosplaying since 2004, but it wasn't until she met the rest of Fighting Dreamers Productions that her passion for cosplaying started. While making her own costumes is fun, Jenna's (Nova's) favorite part of cosplaying is the acting portion. 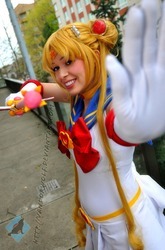 She has always had an interest in acting and film-work so cosplaying has been a fun way of exploring those interests. Her passion for acting has now expanded to behind-the-camera work with cosplay music videos and larger movie productions.